My day often begins with a smoothie. It’s the kind of meal that can be saturated with nutrition, yet make you wonder, “breakfast or dessert”? I find smoothie bowls to be even more enticing. 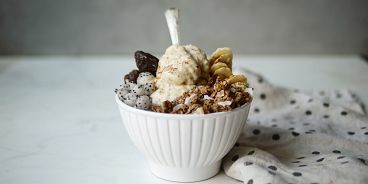 Their thick, ice-cream-like texture and crunchy toppings, like granola, add another level of pleasure to this genre of eating. Nature’s Path Love Crunch Granola is a brand I love because they are 100% organic, vegetarian and committed to ‘giving back’. As part of their Bite4Bite Program, for every bag sold, they donate the equivalent to food banks across North America! This Valentine’s Day, I’ve teamed up with Nature’s Path to create a smoothie bowl recipe incorporating their Love Crunch Dark Chocolate Macaroon Granola. Already filled with organic coconut ribbons and chunks of dark chocolate, there was only one way for me to go with this recipe: TROPICAL. The end result is reminiscent of sweet and salty coconut banana soft-serve. Hope you adore it as much as I do. 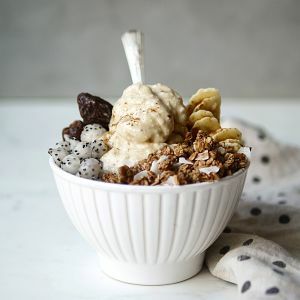 Add all smoothie bowl ingredients to a high-powered blender and, with your tamper tool, continuously and aggressively stir until your mixture until it takes on the texture of ice cream. Add more coconut milk or water if you prefer a thinner smoothie bowl (which is easier to blend). Transfer smoothie to two bowls. Using a ¼ teaspoon (or small spoon), prepare little scooped balls of dragon fruit flesh (for the garnish) and add to smoothie bowls along with remaining toppings. This smoothie bowl could be one of the best ways to wake up your partner on Valentine’s Day?! Love Crunch is sold locally at Superstore, Whole Foods, Save On Foods, or at Well.ca. Thanks to Nature’s Path for sponsoring this post! All opinions are my own.